Retractable housing of these 32GB flash drives easily slides in and out - no cap to lose. Interfaces/Ports Host Interface USB. Product Type Flash Drive. Manufacturers change colors and item details frequently and often do not update pictures. Retractable housing of these 32GB flash drives easily slides in and out - no cap to lose. Host Interface: USB. Storage Capacity: 32 GB. Color: Green. Color: Red. Color: Blue. Windows To Go Certified: No. 32GB drive is compatible with Windows XP, Vista, and Windows 7 and higher; Mac OS X 10.1 and higher; Linux kernel 2.6 and higher. It includes a key ring for added convenience. More from the Manufacturer. MPN: 97408. 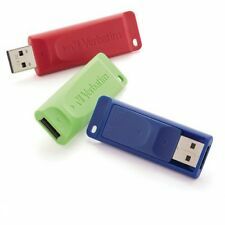 The Lot of 4 Verbatim 32GB USB 2.0 Flash Drive Blue 97408 Retractable Capless NEW shown is the one you will receive. Item is in-hand. COLOR: BLUE. Crush it, boil it, freeze it - the ToughMAX can take it all. Water resistant, crush resistant and temperature resistant, this drive protects against rough-and-tumble use for a variety of lifestyles. 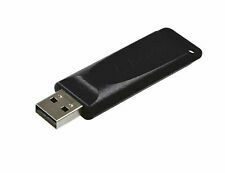 32GB&ltbr> Push-&-pull sliding feature protects the USB connection when not in use&ltbr> Unique pinstripe design&ltbr> Slim, retractable USB connector&ltbr> Compatible with Windows(R) 7&ltbr> 2-year limited warranty&ltbr> 32GB&ltbr>. More from the Manufacturer. Interfaces/Ports Host Interface Lightning,USB 3.0. Product Type Flash Drive. Manufacturers change colors and item details frequently and often do not update pictures. We have no personal knowledge or experience with this product or ability to customize it. Manufacturer Part Number 96806. Product Model 96806. All you need is a PC with a USB port. USB drive works with Windows 8 and Vista. Connector/Port/Interface:USB 2.0. Host Interface USB 2.0. Product Type Flash Drive. The swivel cap allows you to easily plug in and then flip around to protect the USB connector and your data. Physical Characteristics Color Eucalyptus Green. Features Capless,Swivel. Product Type Flash Drive. 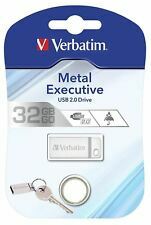 Verbatim Classic USB 2.0 Flash Drive 32GB Blue 97408 - Sold as 1 EA. The retractable housing protects the USB connectors and easily slides in and out, great for preventing breakage and prolonging product life. Manufacturer Part Number: 97408. Product Model: 97408. Verbatim 32GB USB Flash Drive - Blue - 32 GB - USB - Blue. Retractable housing protects the USB connectors and easily slides in and out to prevent breakage and prolong product life. Product Model #: 97408. Product Model # 97408. Product Model: 97408. Manufacturer Part Number: 97408. Retractable housing protects the USB connectors and easily slides in and out to prevent breakage and prolong product life. 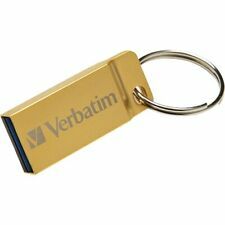 Verbatim 32GB Metal Executive USB 3.0 Flash Drive - Gold - 32 GBUSB 3.0 - Gold. The retractable housing easily slides in and out—no cap to lose. Manufacturer Part Number: 49815. Verbatim 32GB Swivel USB Flash Drive - Eucalyptus Green - 32 GB - Eucalyptus Gre. The swivel cap allows you to easily plug in and then flip around to protect the USB connector and your data. Manufacturer Part Number 97408. Product Model 97408. Product Title Verbatim 32GB USB Flash Drive - Blue (97408). Get back to basics - with Verbatim's classic USB drive! Transport and share files without the unnecessary bells and whistles. MFi certified, this drive is designed for use with Apple iPhone, iPad and iPod products, ensuring the highest quality and reliability. More from the Manufacturer. Product Type Flash Drive. Interfaces/Ports Host Interface USB 2.0. Manufacturers change colors and item details frequently and often do not update pictures. We have no personal knowledge or experience with this product or ability to customize it. The retractable housing protects the USB connectors and easily slides in and out, great for preventing breakage and prolonging product life. UPC: 023942974086. Verbatim® Classic USB 2.0 Flash Drive, 32GB, Blue. The unique flip design allows you to easily plug in and then flip around to protect the USB connector and your data-no cap to lose! Physical Characteristics Color Violet. Product Type Flash Drive. Interfaces/Ports Host Interface USB. Product Model #: 49815. Product Model # 49815. Manufacturer Part Number: 49815. The swivel cap allows you to easily plug in and then flip around to protect the USB connector and your data - no cap to lose! The retractable housing easily slides in and out—no cap to lose. Connector/Port/Interface: USB. Color(s): Blue; Green; Red. Storage Capacity: 32 GB. Total Recycled Content Percent: 0%. Manufacturer Part Number: 98749. It includes a keyring for added convenience. The 32GB drive is compatible with Windows XP, Vista and Windows 7 and higher; Mac OS X 10.1 and higher; Linux kernel 2.6 and higher. Verbatim 32GB USB Flash Drive - Blue - 32 GB - USB - Blue. Retractable housing protects the USB connectors and easily slides in and out to prevent breakage and prolong product life. 32GB USB drive is compatible with all USB ports. Available in a wide range of capacities, the PinStripe USB 3.0 Drive is the perfect storage solution for all storage needs. Verbatim 32GB Pinstripe USB Flash Drive - Black - 32 GB - Black. Product Line PinStripe. Verbatim Store ‘n’ Stay Nano 32 Gb. Condition is New. Shipped with USPS First Class Package. Product Model #: 98749. Product Model # 98749. Manufacturer Part Number: 98749. Host Interface: USB 2.0. Color: Silver. General Information. Storage Capacity: 32 GB. Physical Characteristics. Simply plug in the 32GB drive and start playing, saving or transferring your files. With a micro-USB connector on one end and a USB Type-A 2.0 connector on the other, this drive also functions as a standard USB flash drive so you don't need to carry around separate drives. A perfect storage solution for all your data-storage needs, the PinStripe USB Drive makes transporting and sharing files simple. Push-and-pull sliding feature protects the USB connection when not in use, eliminating the need for a separate cap, which can be easily lost. Slim retractable design is compatible with Linux kernel 2.6x and higher, Mac OS 9.x or higher, Windows 7, Vista, XP and 2000. Memory capacity is 32GB. This Verbatim PinStripe USB Drive 32 GB is new (49064) is new. Interfaces/Ports Host Interface USB 3.0. Product Type Flash Drive. Manufacturers change colors and item details frequently and often do not update pictures. We have no personal knowledge or experience with this product or ability to customize it. Manufacturer Part: 97408. Manufacturer: Verbatim. 32GB USB Drive Blue. UPC Number: 023942974086. Store 'n' Go V3 USB Drive is a world-class storage solution for those looking to save and transfer data faster. The USB 3.0 interface offers data-transfer speeds 10 times faster than USB 2.0, making it easy to transfer multiple files at once or larger files without error. The retractable design with a gray slide shields the USB connector in transit and keeps data protected without the worry of losing a cap. USB drive also offers a 32GB memory capacity. MPN: 96806. See Photos for Details.”. Item is in-hand. 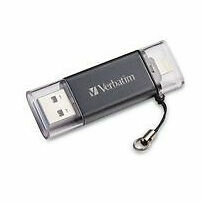 Verbatim® PinStripe USB Flash Drive Features a retractable connector with a push-and-pull sliding feature to protect the USB connector when not in use, eliminating the need for a cap. It features a lightweight, pinstriped design. ToughMAX USB Flash Drive protects against rough-and-tumble use for a variety of lifestyles. 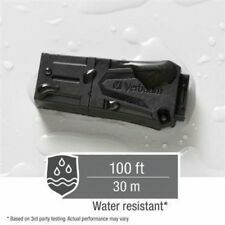 It is water-resistant up to 100', crush-resistant up to 5000 lb. and temperature-resistant from negative 13 degrees to 300 degrees Fahrenheit. Manufacturer Part Number: 70061. The unique flip design allows you to easily plug in and then flip around to protect the USB connector and your data-no cap to lose! Host Interface: USB. Although quite a number of manufacturer have adopted the 100-240v (autovolt) power, still a large number of electronics devices may still be mainly 110v. 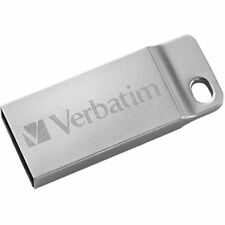 Verbatim PinStripe USB 3.0 USB Drive 32 GB / Go - New In Package Fast Transfers!